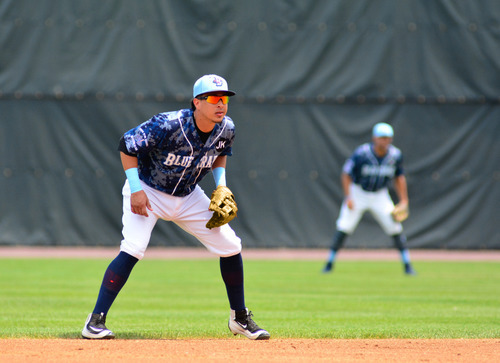 (Waldorf, MD., Oct. 11, 2018)– The Atlantic League of Professional Baseball announced today that Edwin Garcia, shortstop for the Southern Maryland Blue Crabs, has won the 2018 Gold Glove Defensive Player of the Year award. Garcia, in his second season with the Blue Crabs, was named to his second consecutive Red, White, and Blue All-Defensive Team on Wednesday. In his two years in the league, the shortstop has become feared league-wide for his play on the defensive side of the ball. Garcia finished with the highest fielding percentage among shortstops this season, as well as finishing with the third-highest total assists at the position in the league. The Venezuela native was once again a key part of this Southern Maryland team, winning Co-MVP of the team for a second consecutive season. His 119 games played were the highest total on the team and earned him an appearance in his first Atlantic League All-Star Game. Garcia played all nine innings for the Freedom Division in the All-Star Game, going 1-3 with a run scored while playing both second base and shortstop. The Blue Crabs play 140 regular season games in the Atlantic League of Professional Baseball Clubs. The Blue Crabs play at Regency Furniture Stadium in Waldorf, Maryland with affordable family fun. The franchise will begin its 12thseason in April 2019. Please call 301-638-9788 or visit http://www.somdbluecrabs.com for more information.